Running With Scissors CEO Vince Desi isn't backing down from satirical mass murder. When Running With Scissors released Postal in 1997, Senator Joe Lieberman offered a succinct review of the game during a press conference in Washington, D.C: "This is sick stuff. And sadly, it sells." Lieberman and other lawmakers were on a mission to ban or censor many violent, mature games in the United States, and Postal was at the top of the list. It's an action game based entirely on random, mindless killing: Viewing the cartoonish Postal Dude from an elevated perspective, players run through unsuspecting towns, villages and cities, gunning down as many people as possible. Each level ends when the Postal Dude has murdered the required amount of people. It's uncompromising and gruesome, and the gameplay is interspersed with diary entries that read like the religious ramblings of a megalomaniac. It's the kind of game that, even today, would walk a fine line between garnering public praise and open disgust -- and Running With Scissors is ready to see which way the tides turn. Again. Postal Redux, an HD version of the original title, is heading to Steam (for PC, Mac and Linux) this spring and to PlayStation 4 later this year. Running With Scissors CEO Vince Desi is confident that there's an audience hungry for a game like Postal Redux. Part of this is based on experience: The original, non-remastered Postal and its sequels are on Steam, and the reviews are generally positive (though the same can't be said for Uwe Boll's 2007 Postal movie). Over the series' 19-year shelf life, the games have been downloaded millions of times. "When gamers are given the opportunity to choose for themselves, they enjoy playing our games," Desi says. "It truly shows democracy in commerce." Postal's developers are all about democracy. In a press release, Running With Scissors calls the original game "a symbol for free speech in gaming." To Desi, the series is also a bastion of pure, fun entertainment. "From the very beginning, it was our purpose to provide a game that presented violence as an absurdity and never as something realistic," he says. "Running With Scissors has always expressed our belief that violence is best presented as a satirical element in gaming and not in the reality of the streets." 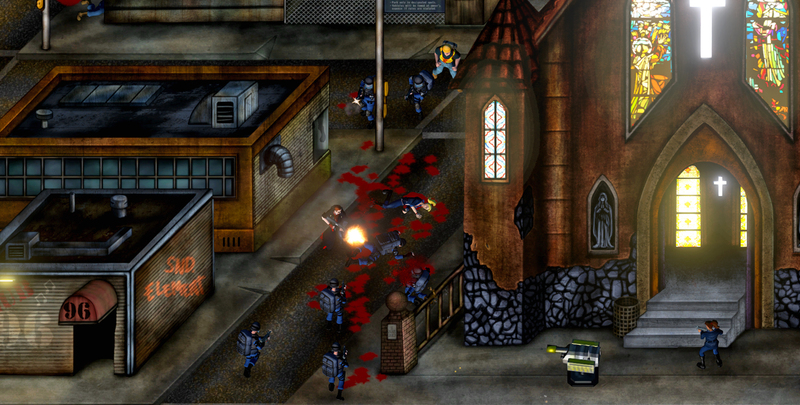 Postal Redux comes with some extra bells and whistles, including Rampage Mode, a new single-player option that "encourages an aggressive style of play" by rewarding long kill streaks and grading performance at the end of each level. Running With Scissors has never backed down from controversy, and it's not about to start now. The game was banned in 14 countries and nearly barred from the US as well, but it's still here, locked and loaded -- and remastered. For Desi, Postal Redux is part of a cherished, 19-year-long conversation with the franchise's fans. "Running With Scissors has always experienced a unique relationship with our fans," Desi says. "We have literally answered tens of thousands of emails and phone calls from our fans, and always done our best to fulfill unique requests." Unique requests like Rampage Mode on PS4, apparently.